Rafael Calvo is Professor at the University of Sydney, ARC Future Fellow and Director of the Wellbeing Technologies Lab. He worked at the Language Technology Institute in Carnegie Mellon University, Universidad Nacional de Rosario (Argentina) and on sabbaticals at the University of Cambridge and the University of Memphis. Rafael also has worked as an Internet consultant for projects in the US, Australia, Brasil, and Argentina. He is the recipient of 5 teaching awards for his work on learning technologies, and the author of two books and many publications in the fields of learning technologies, affective computing and computational intelligence. Rafael is Editor of the Oxford Handbook of Affective Computing and co-author of “Positive Computing” (MIT Press) with Dorian Peters. 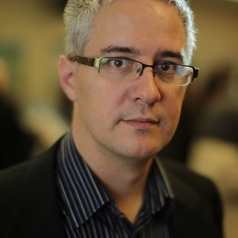 Rafael has also been Associate Editor of the IEEE Transactions on Affective Computing, IEEE Transactions on Learning Technologies and the Journal of Medical Internet Research Human Factors (JMIR-HF).